Born 1944 in Grão Mogol, Minas Gerais, Brazil. Died 1986 in Montes Claros, Minas Gerais. In 1964 Raymundo Colares moved from Grão Mogol to Salvador de Bahia with a scholarship to study engineering, but he soon gave up his studies to pursue art, inspired by the works of Piet Mondrian and Paul Klee. He settled in Rio de Janeiro in 1965 where he worked as a jewellery designer at H. Stern. 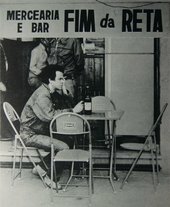 The following year he was admitted into the Escola de Belas Artes where he met Antonio Dias, Antonio Manuel, Wanda Pimentel and Hélio Oiticica, among others, and associated with the Brazilian new figuration. In 1967 he abandoned his studies once again to join artist Ivan Serpa’s independent studio at the Museo de Arte Moderna. In this period Colares’s painting reached a phase of maturation where he developed an aesthetic that would define his practice for over a decade. He participated in the landmark exhibition Nova Objetividade Brasilera, marking his alignment with the objectives of the Brazilian avant-garde. Raymundo Colares produced the Untitled aluminium foldable panel in 1969. Exhibited in his first solo show in Rio de Janeiro, the panel captures the artist’s ambivalent relationship with the urban landscape, a persistent theme throughout his practice. Both fascinated and disturbed by their prominence, his work depicts the geometric designs commonly found on the sides of buses, the quintessential symbols of urban dynamism and motion. Through the use of crisp edges, familiar commercial enamel colouring, numbers and a rational division of space, Colares’s panel unfolds a visual narrative on multiple spatial planes imposing order on the confusion of the city. In contrast with his early works on canvas, the rhythm asserted by the three-dimensional panel acquires a corporeal aspect. The viewer’s body is traversed by the vertigo of the city’s frenetic pace. Strengthening a connection with motors, movement and urban life, the aluminium panel combined the aesthetics of Brazilian concretism and pop art with the mechanical dynamism of futurism.